From 1756 to 1763 the great powers of Europe engaged in a global contest for empire called the Seven Years’ War. The French and British fought several battles in the borderlands of the Ohio Country, northern New England, and New France. Native Americans played pivotal roles in the North American conflict that came to be called the French and Indian War. In 1763, the British emerged victorious and the French were forced to relinquish their North American colonies in the Treaty of Paris. This marked the end of the French empire in North America and the extension of British power into present-day Canada. Native Americans resented the new British presence and power. 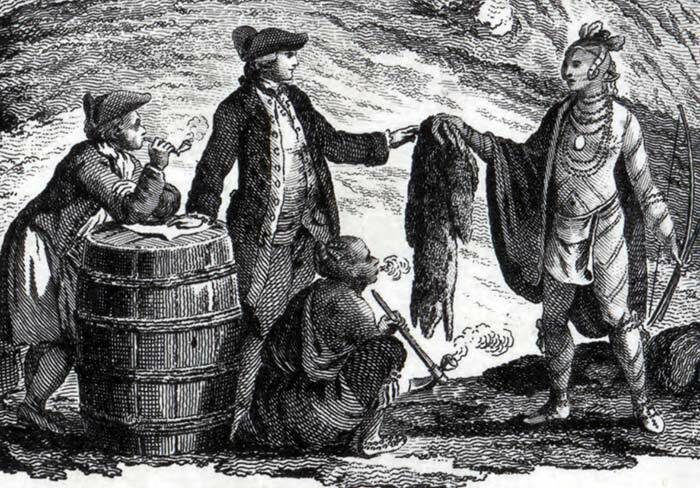 The British Army did not continue the same gift-giving practices of the French and soon Pontiac’s War (1763–1766) followed, as Native warriors refused to accept the conditions of peace that Britain imposed and France accepted. Following the war, the British government lifted restrictions on trade and British traders streamed into the interior. Although the French and their Native allies had been locked in a violent struggle with the British and had animosity towards them, people in the interior were relieved to see the end of the war. It had interrupted trade and caused hardship. Although the British made claims to the Great Lakes region, in actuality it continued to be controlled by Native Americans and dominated by indigenous customs and protocol. When the American Revolution erupted in 1775, trading routes across the Great Lakes area shifted. The war had a devastating effect for Native Americans. The formation of the Continental army set off a smallpox epidemic that swept across the continent. The Ojibwe had survived an outbreak in the 1750s, but still Ojibwe from Fond du Lac, Rainy Lake, Sandy Lake, and nearby were devastated by smallpox. Between 1,500 and 2,000 people died in one year alone. Such profound losses in numbers had an effect on Native Americans’ relationship to trade with Europeans. There were not enough people to hunt and meet their families’ needs without outside help. Some Native communities became more dependent on the trading economy as hunger forced them to rely on credit from traders to get them through periods of starvation. The British brought radically different views of race and culture to the Great Lakes region. The creation of the North West Company introduced concrete social changes to the fur trade. French Canadians were more numerous than Anglo Canadians and continued to have important roles in the trade, but the more important and authoritative roles went largely to those of British descent. A rigid company hierarchy was established that placed the British at the top and the French and “mixed” people lower down. The British clerks and bourgeois took pains to keep a social distance from the French Canadians and the Native Americans, and looked down upon them. Calloway, Colin G. The American Revolution in Indian Country: Crisis and Diversity in Native American Communities. Cambridge: Cambridge University Press, 1995. Campbell, Marjorie. North West Company. University of Toronto Press, 1983. Tanner, Helen Hornbeck. Atlas of Great Lakes Indian History. Norman: University of Oklahoma Press, 1987. White, Richard. The Middle Ground: Indians, Empires, and Republics in the Great Lakes Region, 1650-1815. Cambridge University Press, 1991. 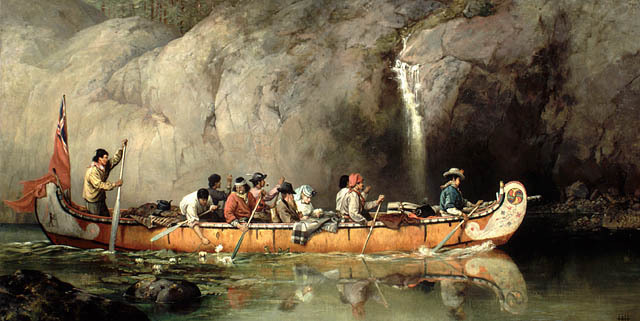 The Red Lake Chief with some of his followers arriving at the Red River, Peter Rindisbacher, 1825. 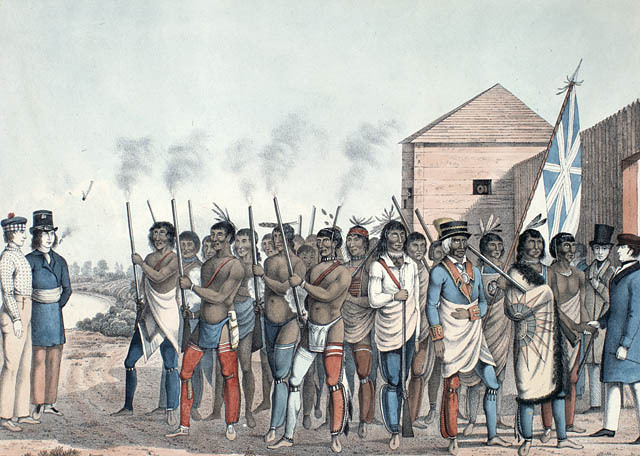 The Red Lake Chief with some of his followers arriving at the Red River, Peter Rindisbacher, 1825. Source: Library and Archives Canada. "A map of the Inhabited Part of Canada from the French Surveys; with the Frontiers of New York and New England", 1777. "A map of the Inhabited Part of Canada from the French Surveys; with the Frontiers of New York and New England", 1777. Source: Library and Archives Canada, originally from: Cartouche from William Faden.